‘As the government tightens its grip on the critical press, we explore the issues behind Turkey’s media takeover and the future of journalism in Turkey. Published on Mar 14, 2016’. As I wrote some days ago: “The day prior to the government takeover, the daily Today’s Zaman issued a statement expressing concern over “Turkey’s democratic performance” and urging a “return to democracy and the rule of law.” These sentiments may very well have been disingenuous or true-and-heartfelt, but they nevertheless appear to have come just a little too late. One could argue that Tayyip Erdoğan and his AKP would never have never reached their current lofty status without the Gülen Movement’s willing help and cooperation . . . As put by Şeyma Gelen, a headscarfed feminist and researcher at the Université Libre de Bruxelles, “[n]ot everyone [in Turkey] is concerned with issues concerning freedom of expression, freedom of the press, the status of women or the concentration of power.” Both Islamist factions were happy to cooperate in previous years, and now that the happy union of yesteryear is no more, the AKP is consolidating its firm grip over the country, while its supporters welcome such actions as appropriate measures that safeguard the country and its traditions . . . or rather its one tradition of authoritarianism that has now seen its full culmination in the figure of Recep Tayyip Erdoğan, the one and only politician to have successfully [re-]introduced Islam into the body politic of Turkey”. C. Erimtan, “Islamic Authoritarianism and Freedom of the Press in Turkey” NEO (12 March 2016). http://journal-neo.org/2016/03/12/islamic-authoritarianism-and-freedom-of-the-press-in-turkey/. ‘Eski Başbakan Yardımcısı Bülent Arınç, Eğrisi Doğrusu‘nda Taha Akyol’un sorularını cevaplandırdı. Arınç, çözüm sürecinde yaşanılanları anlattı, terör sorununun bitmesi için “adı ne olursa olsun yeni bir sürecin başlaması” gerektiğini ifade etti (1 Şubat 2016)’. ‘Emniyet İstihbarat eski Daire Başkanı Sabri Uzun’un [Ocak 2015’de] piyasaya çıkan İN adlı kitabında Paralel yapının bütün kirli operasyonları gözler önüne seriliyor. Kırmızı Kedi yayınlarından çıkan kitap 12 bölümden oluşuyor’. “Sabri Uzun yeni kitabında paralelin ‘İN’ine kadar girdi!” Sabah (09 Jan 2015). 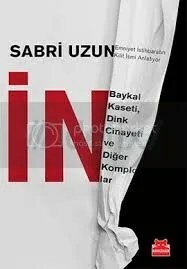 http://www.sabah.com.tr/gundem/2015/01/09/sabri-uzun-yeni-kitabinda-paralelin-inine-kadar-girdi.